VJC Boys defeated MJC in a nail-biting match, winning 3-2 to secure the National ‘A’ Division Boys Soccer Champion. It was such a exhilarating match. VJC scored first 1-0. MJC got 2 shots in to make it 1-2 before VJC equalised before half time to make it 2-2. 2nd half was evenly matched and VJC secured the deciding goal 5 minutes before full-time for the sweetest of victory!! Besides the coveted title, VJC soccer boys also secured the Top Scorer for the Series as well as Player of the Match for the Finals. Jalan Besar Stadium, Monday, May 25, 2009 – Victoria Junior College scored a stoppage time goal to eke out a 3-2 victory over Meridian Junior College. The 3pm start time under the scorching sun plus the adrenaline of a national football final meant fitness would come into play in this game. Added to that the heart-pounding and ear-splitting cheering from supporters of both schools – the loudest cheering you’ll hear at a football game on this island – the stage was set for an exciting game. A blistering start saw VJC take an early 1-0. Alex (#10) found some space on the left flank and his cross was met by Asyraf who placed his header over Edmund Wong in the (#32) in the MJC goal. 1-0 to VJC. But MJC came right back. Their constant pressure yielded them a free-kick from 30m out. Up stepped their captain Fazli Hisham (#7) who hit it straight at the VJC keeper Ifwat Wafiy. It was not a hard shot and everyone expected the keeper to pluck it safely from the air. To his and the collective horror of the VJC crowd, it squirmed from his outstretched hands and bounced over the line. 1-1 and the MJC crowd roared their approval. Man for man, MJC had the measure of the VJC team, nullifying any attack, while their constant probing left VJC fans with the gnawing dread of another MJC goal. 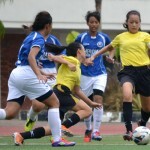 Alex (VJC #10) then missed a one-on-one situation to leave the score unchanged and the miss would haunt VJC. VJC’s Jasper gave away another free-kick to MJC and this time Attah Joseph (#21) stepped up. Of all the people in the VJC wall, Joseph’s blast chose to take a wicked deflection off the head of Jasper and the ball hit the back of the net while VJC keeper Ifwat was left flat footed. VJC, and Jasper, were feeling particularly unlucky by now. With MJC holding their first lead of the game at 2-1, VJC did not look likely to score. But an individual piece of finishing by Alex changed the scoreline. VJC keeper Ifwat’s kick upfield was met by the head of Anders Aplin (VJC #9). Another teammate met Anders’ header with another flick on and the ball landed nicely in the path of Alex who bore down on the right side of the MJC penalty box. VJC fans wondered: Was he going to shoot? His answer was instantaneous – a blast with his right leg that arrowed across the diving body of MJC keeper Edmund Wong to nestle in the far corner of the net. A predator’s goal and the score was now 2-2. Game on. After the excitement of the first half with four goals and lots of action, the second half was an anti-climax. The 3pm start had taken its tolls as players from both teams going down with cramps. The most pained sufferer was Attah Joseph (MJC #21) whose cramp was so severe he was in agony, his bulging thigh muscles so rigid with cramp he had to be carried off the pitch. With the injuries, the game was going nowhere as a spectacle but with the passing minutes, the tension ratcheted up. A goal at this late juncture would surely spell the winner. MJC had two golden chances to score through Joseph Tai (MJC #23), the second of which was a header that was headed for goal but Ifwat pulled off a stupendous save to make up for his first half error. 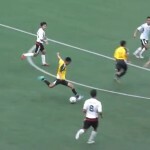 Then came the miss of the game by Alex (VJC #10), this year’s top scorer with 16 goals. A blistering shot by Anders (VJC #9) from outside the box was not held by MJC keeper Edmund. The ball spilled loose and bounced up nicely into the path of the onrushing Alex. However, from less than 2m from the goal line and with the whole goal gaping before him, he somehow contrived to put the ball over the bar. Even though the ball fell to his weaker left leg, he pounded the ground in extreme frustration while the VJC bench saw coach Tan Yew Hwee sprawl to the ground like he had been shot. The VJC bench must have thought this was going to be a repeat of the 2008 final where Alex also missed chances that cost them the championship title. By this time, everyone was expecting extra-time but the final act was yet to be played out. In the second minute of extra time, a throw in by Cephas Ong was headed on by Anders Aplin. In the middle was the waiting Muhammad Khairil (VJC #5). Rising with him were two MJ defenders but Khairil got his head to the ball first. It was not a hard header but the ball’s bounce fooled MJC keeper Edmund and went in to send the VJC crowd into delirium. 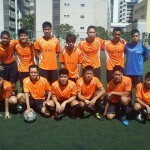 3-2 to VJC was how it finished, and VJC put to bed their 1-2 loss to MJC in last year’s final. 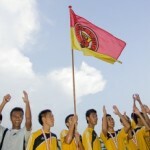 In an on-field incident witnessed by many and sure to be discussed for days on end, the MJC taunt to VJC to “go fly kite” got the better of VJC’s Khairil and he made a mocking gesture – putting his thumb on his nose and wiggling his fingers – to the MJC crowd in return after teammate Alex scored the second VJC goal. After getting scolded by coach Tan Yew Hwee immediately after the incident, Khairil was marched to the MJC principal after the game by his coach and made to apologise. The winning goal was unexpected. “The goal was a soft goal,” he said. For MJC, this was their fifth A Division final appearance in a row. “It was a very good save by the VJC keeper,” said coach Fabio, referring to the save from Joseph Tai (MJC #23) in the dying moments of the second half. MJC are also well placed for A Division football honours next year. “Seven of the players will be back next year,” coach Fabio confirmed. Khairil finished the season with four goals, but that last one will live long in the memory for him and VJC. anyways, i for one is willing to forgive him if he’s sincerely apologised for wat he did to us…we are still good frens, even tho i might still scold him abit for his actions..
You mean no VS boy was there? When RI(RJC) get into finals, RI (secondary) students are also there to cheer. Just wanted to say that other then vjc, i think mjc has a lot of old vs boys as well. at least that is the trend in recent years. for one, joseph from the mjc soccer team is from vs. There are very good pictures of the soccer finals at the Red Sports website (somehoe I could not post the site here, always get rejected). The Khairil incident has also generated 19 pages of responses from VJC and MJC supporters. Seem like many of the VS boys could not get into VJC. VJC does not win the Cross-Country title, and the VJC hockey team is represented by rookies as reported by the Straits Times. Hello, can someone pl let known whether VS B an C boys have qualified for the national finals and if so, date and venue of the matches. Many thanks. Viva VS! Can Mr Muhammad Khairil or his friend get him to contact me at 96304050? It is regarding his physics tuition fees.